At midnight last night, the deadline closed for UK employers with more than 250 employees to file data on how much men and women are earning. All over the world, men are on average paid more than women, so it’s hard to deny that the gender pay gap exists. But there is a big debate over what actually causes the gender pay gap. Is it outright discrimination by employers? Or is it about different educational achievements, choices of occupation or the imbalance of caring responsibilities between men and women? ICYMI: For the past few months, data has been trickling into a government database on pay levels for employees of UK companies and organisations, to get a clear and full picture of the difference in pay between men and women, or the ‘gender pay gap’. The UK is the first country to implement mandatory reporting in such detail, on the grounds that revealing the full extent of the pay gap may lead to policies that will help tackle the problem. 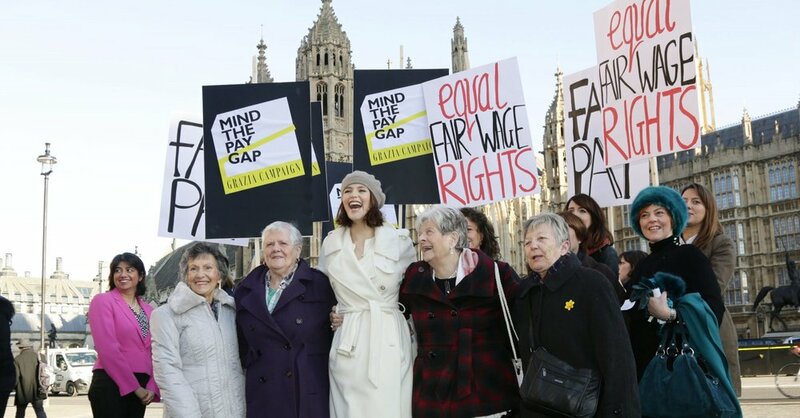 People are still arguing whether the gender pay gap even exists, even before figuring out where it comes from and how to make it go away – this is about proving that the problem is real, as a first step towards fixing it. Still, even this data doesn’t tell the whole story – it doesn’t show how often men and women are paid differently for similar roles, for example, and it’s missing contracted workers, and company partners (on the grounds that they’re different to ‘normal’ employees). This piece of research only looks at the differences in pay between men and women. But a lot of people think this is just the tip of the iceberg. The racial pay gap looks at differences in average pay between white people and people of colour. In Western economies, white people typically earn more than people of colour. If you are a person of colour and a woman, you are much more likely to have an even lower wage. For example, in the US black men earn about 25% less than white people, and black women earn 36% less than white people. Research from the UK suggests that there is a 23% pay gap in hourly pay between black and white university graduates. Women earn less than men in eight out of 10 companies and public bodies: of the 10,016 companies which filed data by last night, women earn less in 7,795 of them. Nine out of 10 public sector bodies pay men more: men earn more in the NHS, where 77 per cent of workers are women, and in local government, where 78 per cent are women. Some sectors are worse than others: the construction sector reported the worst average median gender pay gap at 25 per cent. This was followed by finance and insurance at 22 per cent. Education also does badly, despite the fact there are a lot of highly-educated women in the sector. There’s a pay gap of 20 per cent. Women are under-represented in the top level of companies: even when there are a lot of women working in a company, if the amount of women in the management level of the company is disproportionate, then their average pay is likely to be lower. According to analysis of the data, women are under-represented in high paying jobs in 82 per cent of companies, when compared to how many women are working in the company as a whole. Even in places where the pay gap on official salaries is low, the 'bonus' gap is extremely high. Women's mean hourly rate at Facebook is only 0.8 per cent below men's, but their bonuses are 40 per cent lower. Google's 'bonus gap' is 40 per cent, IBM is 33.9, Intel is 46.4... you get the picture. It opens up questions about the cultural differences that lead to the pay gap – are women genuinely performing on average 40 per cent less well than men, or is it something to do with the a 'confidence gap' in asking for reward and recognition?